Note the location, Sector 22 of Kharghar (Navi Mumbai) is where City’s first public golf course is operational since 18 in February 2012. 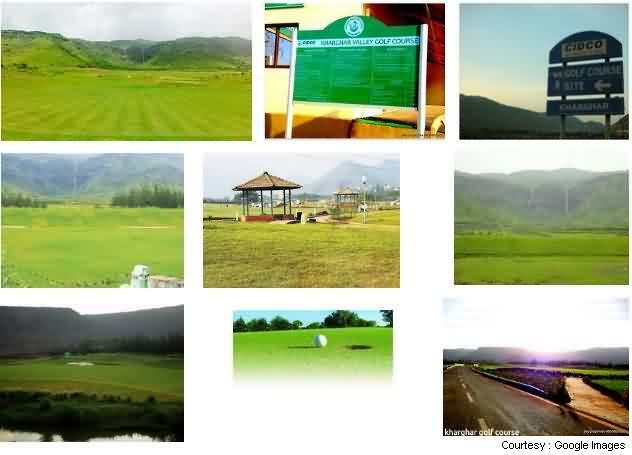 This is a 11 Holes Golf course in 103 hectares area at about 4 Kilometres from Kharghar Railway station. Since its inauguration, CIDCO has been taking care of all aspects of this beautiful green play area located in Kharghar valley surrounded by lush greenery, mountains and the very famous Pandav kada waterfall not far from Mumbai Pune National Highway 4. This golf course is adjacent to beautiful Central Park area at Sector 23, 24 and 25. The Hilly mountain location of this ground is about 7137 yards and is more than 100 Hectares also called ‘Magnum Opus Golf and Country Club’ of Mumbai. As per the plans, CIDCO has targets of opening 18 Holes International Quality & Standards golf course to Public, But due to some legal permissions issues from Forest Departments in the plot area, only 11 Holes golf course is ready to play. This green land is designed by an Australian company ‘M/s Pacific Coast Design’ based in Melbourne. Projected total cost of all 18 holes was Approximately 50 Crores, where as about 38 Crores is spent for the current active 11 Holes. Figures may or may not be exact, But just to get an general idea on Kharghar golf course costing. O & M Agency is appointed to take care of this course and the gaming activities inside. They also take care of the maintenance and smooth running quality experience to members and foreign tourists visiting. Apart from daily public use, Authorities has also planned some national and international level Golfing events which was previously not possible in Mumbai city. This will give boost to overall Tourism industry and city attractions, Sports and Adventures. There are Club House, Luxurious and Beautiful Villas, Bungalows and Other Residential apartments facilities around the Golf course with the Golf Academy planned where one can learn professional golfing in Mumbai. Charges of playing and practising at golf club of Kharghar are detailed below, Kindly note that this may change from time to time. Membership Charges may have changes now. Individual Lifetime Member : Rs Five Lakhs. Membership (2 Members) : Rs. Seven Lakhs. Membership For Corporates : Rs Ten Lakhs. Single Person : Rs.1200 + Taxes. School Students (till 10th) : Not allowed. CIDCO employees (Including Ex-Workers) : Rs.600 + Tax. Foreign Nationals : Rs.2400 + Tax. Single Person : Rs.600 + Taxes. School Students (till 10th) : Rs.300 + Tax. CIDCO employees (Including Ex-Workers) : Rs.300 + Tax. Foreign Nationals : Rs.1200 + Tax. Learning Golf in Mumbai is possible too at Kharghar course. For 50 Balls charges are Rs.50 and Similarly Rs.100 for 100 Balls. Below are Couching / Learning / Practising Charges. Individual (Age 16+) : Rs.400 + Tax. CIDCO Employees (Also EX) with Family members : Rs.200 + Tax. Children (Below 16) : Rs.200 + Tax. 6 Seating Cart : Rs.1200 + Tax. 4 Seating Cart : Rs.800 + Tax. 2 Seating Cart : Rs.500 + Tax. Golfing Timings : Timings Differ by Half Hour during Summer and Winter, Yet the Approximate timings are between 6:30 / 7:00 Am to 3:30 – 4:00 Pm. Booking and Other Contacts : +918850405083, +917718938228, +918169305118, +919220913078 (For Booking), +919022223567. Kindly contact booking number for enquiries etc. By Air : Kharghar Golf Course is about 34 Km from Mumbai International Airport, taking about 59 Minutes (1 Hour) by road, See Mumbai Airport to Kharghar Road Distance for more details. By Road : Kharghar is located in Navi Mumbai Pune Express Highway 4, So plan you road trip to and from Mumbai city accordingly. By Train : Checkout the Railway Map to get better idea of where exactly Kharghar Station is in Central Railway route. Two other Golf courses which at Lodha Golf is at about 13 Km and (BPGC) Bombay Presidency Golf Course at distance Approximate of 17 km from Kharghar Golf.